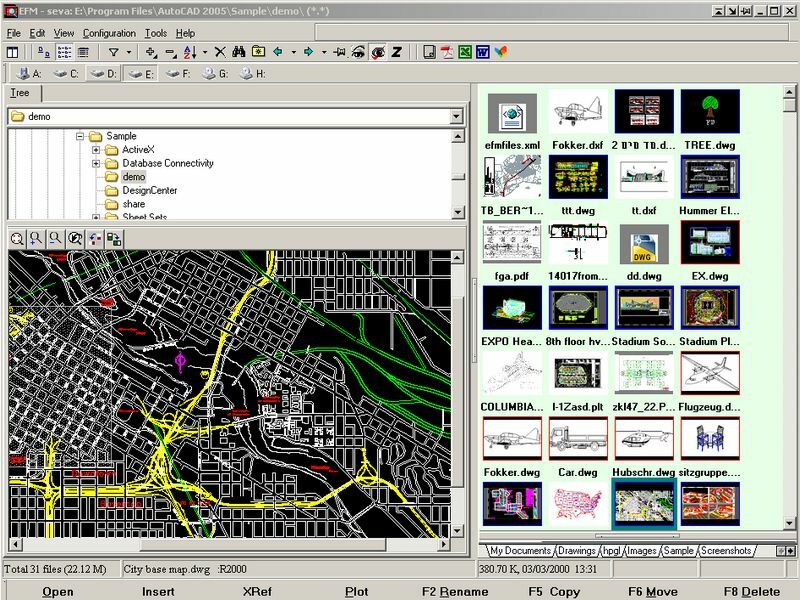 EFM QV is an inexpensive CAD and graphic image organizer and viewer support for all the main image formats. Locate, retrieve, and plot files quickly. Display directories in thumbnail and list view. Attach descriptions to files and directories. Have direct access to AutoCAD/IntelliCAD commands. EFM QV is easy to learn and easy to use. It installs and loads quickly, and it is optimized for high-efficiency work with AutoCAD/IntelliCAD. All-in-one solution for managing CAD & Image files/archives, front-end to CAD. - Display directories in large and small thumbnail as well as in list view. - Attach descriptions of any size to files and directories for easy identification and enhanced search capability. - Have dual-pane file manager windows. - Have direct access to AutoCAD/IntelliCAD commands. - Add icons of external programs to the EFM button bar. - Perform block management and batch processing with AutoCAD/IntelliCAD. - Share a variety of file formats with non-CAD users. EPS,ECW, ICO, WMF, JPG, GIF, PCX, TARGA, TIFF, PNG, HTML, DOC, TXT, XLS, RTF. organize your work, and saves you time and money. Qweas is providing links to EFM QV - Etecad File Manager Quick View 2.10.1 as a courtesy, and makes no representations regarding EFM QV - Etecad File Manager Quick View or any other applications or any information related thereto. Any questions, complaints or claims regarding this application EFM QV - Etecad File Manager Quick View 2.10.1 must be directed to the appropriate software vendor. You may click the publisher link of EFM QV - Etecad File Manager Quick View on the top of this page to get more details about the vendor.